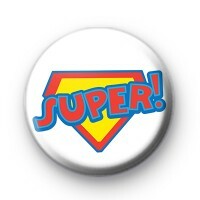 Fun, bright 1-inch super pin badge. This blue, red and yellow badge is a great one for schools, kids clubs and superhero themed parties. It's a positive badge and one that would be fun for a party goody bag.